Railpictures.ca - Nick Batten Photo: In a very Pacific Northwestern scene, Amtrak 206 hustles through fog, rain, and wind past Lake City in Burnaby, BC, as it hauls the northbound Cascades on the last leg of its journey into Vancouver. | Railpictures.ca – Canadian Railway Photography – photographie ferroviaire Canadienne. 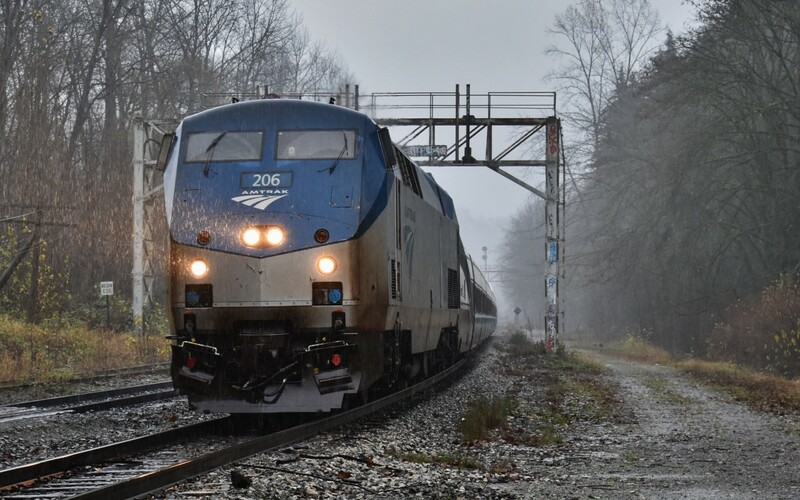 Caption: In a very Pacific Northwestern scene, Amtrak 206 hustles through fog, rain, and wind past Lake City in Burnaby, BC, as it hauls the northbound Cascades on the last leg of its journey into Vancouver.